If you’re reading this and you attended a Diablo 3 midnight launch, I’m going to go ahead and assume that you survived your clickathon which probably lasted into the wee hours of the morning. With various retailers offering launch parties, it may have been tricky to choose where to go. I attended the BT Games Eastgate launch, and they seemed well prepared for the occasion. I arrived at the store around 9pm, and even then the queue was already relatively long. There were a couple of people just outside the store entrance, and many more crammed inside. The general process was that you paid and then waited until around 11pm when the actual game would be given to you. The queue shortened quickly, which resulted in waiting time before you could claim your copy. This made some good business for the Maxi’s just next door which stayed open for the occasion. If your wallet had no minerals for a meal or drink, BT had a fair supply of their own which made the waiting process a lot less painless. To sweeten the whole experience, A BT official was handing out “doctors notes”. If you tried to use one of these (and I wouldn’t be surprised if some people did), I’d love to know if it worked or not. Either way, it was a nice touch to the evening as a whole. There were a few people who dressed up for the Cosplay, but not as many as I thought there would be. 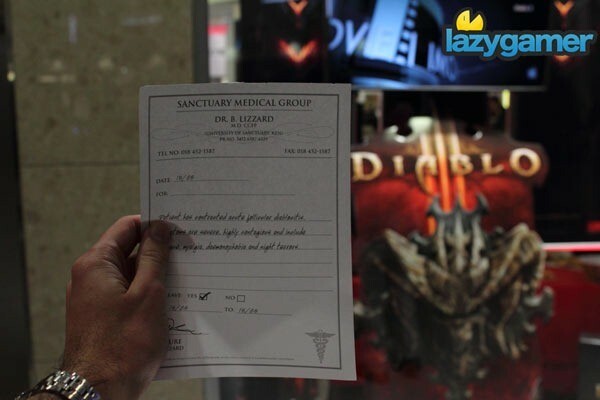 Possibly this stores demographic of customers were just not up to entering the cosplay competition which promised reward of a Diablo 3 Collectors Edition, R5000 gaming voucher, and various other goodies to one lucky winner (to be determined by votes online). Nonetheless, the ones who did turn up really did put a lot of effort into their costumes. It never ceases to amaze me how social gamers can actually be. The typical worldwide stereotype is that the average gamer hides in their basement, only braving the outside world when sustenance or a new game is needed. I bumped into a few people that I hadn’t seen in months, and I even had some good long chats with random strangers about their latest gaming experiences. I even chatted to a few people who weren’t there for the game, but only attended just to keep their friends company. 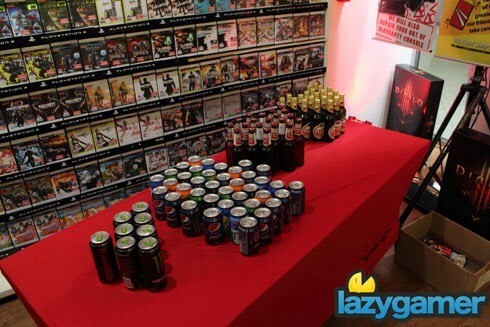 Did you claim your Lazygamer raffle ticket? Remember that there is a sweet bundle that will be given away during the course of this week. Keep your eyes on lazygamer.net for more details! A huge thank you must go to BT Games for making a huge effort in making game launches more enjoyable. Customer complaints were dealt with professionally, and the entire evening ran smoothly and without a hitch. So which launch did you decide to attend? 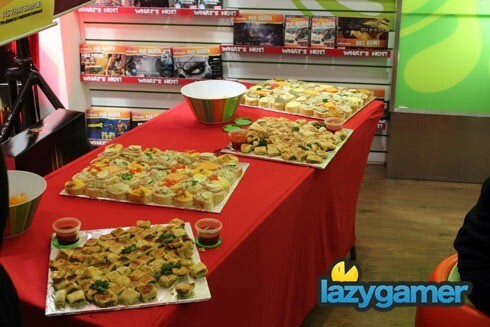 Would you attend another launch from the same retailer?